WASHINGTON, April 8, 2014 — Nearly 70 million in America don’t have any emergency savings to withstand a sudden financial shock, while 22 percent of Americans or about 53 million have savings enough only to hang on for a month according to a new consumer survey from NeighborWorks America. Forty percent of consumers say that their cash reserves woul last as long as three months, and 28 percent expect their emergency fund to hold them over for a year. In all, sixty-eight percent of consumers say that they’re setting money aside in case of a financial emergency. 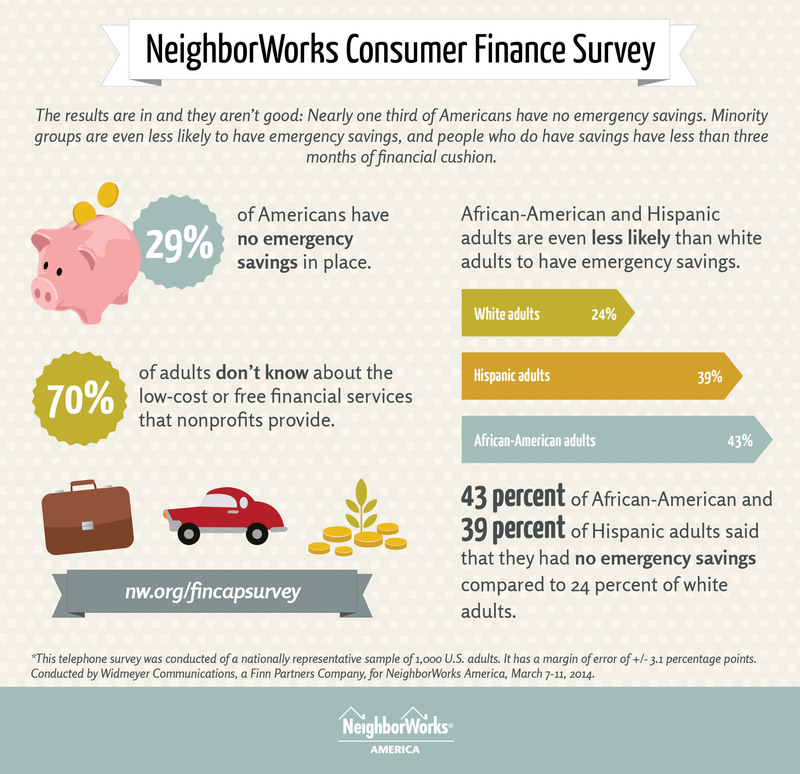 The survey results were released today by NeighborWorks America to mark the beginning of financial capability month, call attention to the fragility of many families’ finances nearly five years since the end of the Great Recession, and assess consumers’ interest in nonprofit resources to help them build financial stability. The survey also examined the savings goals of Americans. Retirement and buying a home are the top savings goals at 28 percent and 13 percent, respectively, with just five percent of consumers saying that they are currently saving to create a buffer in case of a financial emergency. Among those surveyed nationally, 29 percent of adults report no emergency savings; of these 43 percent of African-American and 39 percent of Hispanic adults said that they had no emergency savings. As might be expected, the survey results bore out that the more income a person has, the more likely they are to have built an emergency fund. Just 11 percent of people making $100,000 or more per year said that they had no emergency fund, while more than half (52%) of people earning less than $40,000 said that they had no such reserve. People whose income places them squarely in the middle class also are financially vulnerable, with 24 percent of adults with income between $40-59,000 holding no emergency fund. NeighborWorks America is committed to building consumers’ financial security throughout the country by offering comprehensive training and impact evaluation services for nonprofit professionals to develop and scale financial capability programs in their communities. The nonprofit organizations across the country that NeighborWorks supports, the NeighborWorks Network, are offering financial capability services to help alter these trends, with establishing emergency savings plans being just one component of a full service financial coaching and individual financial capability effort. Results from a recent national financial capability demonstration project had positive results. The program saw 57 percent of the people who started with zero savings establish a habit of savings, while 48 percent of the people in the program who already had a savings habit increased the amount set aside for emergencies and other goals. Financial capability is more than learning about credit. Financial capability can level the economic playing field by offering the information and support that helps consumers reduce debt, increase savings, and reach their financial goals. For 35 years, NeighborWorks America has created opportunities for people to improve their lives and strengthen their communities by providing access to homeownership and to safe and affordable rental housing. In the last five years, NeighborWorks organizations have generated more than $19.5 billion in reinvestment in these communities. NeighborWorks America is the nation’s leading trainer of community development, financial capability and affordable housing professionals.